The organizations with small-sized operations in the services sector running on their platforms face difficulties in seeking assistance to migrate to the cloud. On the other hand, the large-scale companies have various options and access to support when handling their migration requirements. They are not concerned much as they have Microsoft resources for implementing the migration through a lift and shift to the cloud handling back-up, upgrade and deployment in the cloud. However, the life for small-scale companies is not as easy as there are no ready solutions available for them to get them onto the cloud and it’s not easy to find expert MS Dynamics CRM developer. In this scenario, small scaled businesses may feel it is best to rely upon internal resources to initiate the migration to cloud and manage it in a phased manner over the period on a trial and error basis. However, the experience indicates that it is best to associate with Microsoft partners with adequate expertise and experience in handling migrations. The long-term budgeting or costing of the latter option works out to be better for any scale business for that matter. So it is a piece of advice to seek for a suitable Microsoft Partner to assess and complete the migration. The migration is a unique exercise for each business, mainly due to the diverse combination of factors, i.e., the size of the database, the customizations made in existing system, requirements to take the system on cloud and eventually have a targeted structure. The aspect of personalization and customization is reviewed in the following sections to gain a basic understanding of its impact on the migration process. The customizations which are currently running on Dynamics 2011 and above can be migrated to cloud-based systems easily and require a smaller timeframe. However, the operations in Dynamics 2011 would need an upgrade to at least Dynamics 2013 before migration. In addition to the above, it is noteworthy that all customizations of Dynamics might not be supported due to a particular limitation in cloud-based platforms especially related to custom plug-ins, customized reports, and integrations which need database support. Dynamics 365 on cloud platform allows a custom report to be generated with FetchXML coding, thus if existing custom reports are Direct SQL based these shall have to again coded. This effort could effectively be a problematic job based on the complexity of the reports. Integrations which are based on the database also need recoding as Dynamics 365 shall allow access only through the APIs. Data Migration is the primary task concerning the time required for migration to cloud-based platform primarily due to the size of data, its integral relationship with systems and the cleanliness/integrity of the data in existing on-premise systems. The task becomes easier if standardizations were followed in setting-up in-premise network systems. The starting point is choosing the path for migration as whether the data is to be migrated through one-to-one basis between source platform and Dynamic cloud platform or data would need transformation before movement. The path of makeover would need a longer implementation timeline as compared to the one-to-one mechanism. Experts generally advise that a hybrid approach must be considered wherein the transformation is called for where required and then migrated on the one-to-one basis. The data needs to be analyzed which is targeted to be migrated. The quantum of data, quality of data, priority/significance of the data sets for cloud-based operations – are all factors – which play an essential role while lining up the data for migration. There are various tools available in the market which makes it accessible for the small-to-mid scale companies to migrate to cloud-based platforms which include Cobalt Dynamics, Kingsway Soft, and Scribe to name a few significant ones in the market. Each of them has their own set of advantages, strengths as well as weaknesses which need to be understood before selection. The client must assess the options before selection because of the complexity and quantum of data in existing in-premise platform. Once the selection of a precise partner and tool is made to migrate to the cloud, there will be challenges on the way. The difficulties will include mid-way adjustments, customizations, hiccups due to online performance, the throughput of systems engaged, dirty data as well as data integrity. However, the journey of migration to the cloud is a worthy one as partners are available to handhold. Whether you prefer to migrate yourself or you want to make use of a partner to lend a hand with your migration, Prompt Softech can always assist you. At Prompt Softech we are a specialist Microsoft Dynamics CRM development company. Migration Dynamics comprise free support to make sure you have a flourishing migration if you desire to migrate your data by yourself. If you are a partner and would like to partner with Prompt Softech to back you with the Migration of your clients, we are on hand to do so for every single phase of the required Migration. If you are a customer that doesn’t have an in-progress Dynamics partner, feel free to get in touch with us. 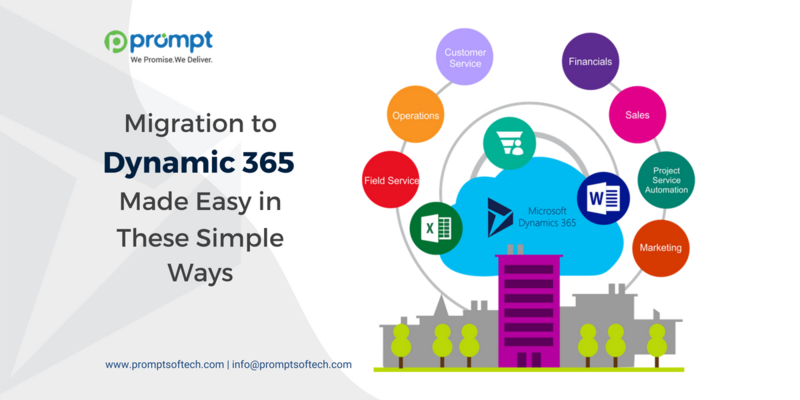 Prompt Softech has transformed multiple Dynamics companies to Dynamics 365 in the past years, and we would be happy to help you with your project.